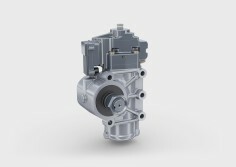 The iHSA technology patented by tedrive can be modularly integrated into tedrive recirculating ball steering systems. The results are convincing in terms of driving dynamics, comfort and safety, as the iHSA control module incorporates an active lane departure warning system, amongst other benefits, with the aim of reducing serious accidents. Through the torque overlay of the iHSA it is now possible for trucks and buses to be steered independently of the driver and – in addition to the active lane departure warning system – fitted with a manoeuvring aid, side wind compensation, automated bus stop approach and many other support functions.